I am not mature enough to be a parent. Apologies in advance, SharkBean. When I go to the pet store to restock on dog food, I always check for new and enriching toys for the dogs. Chances are good that a couple of toys usually make their way into my cart, and since the dogs have gotten a little less destructive in the last couple of years, let's just say they have a good selection of toys. 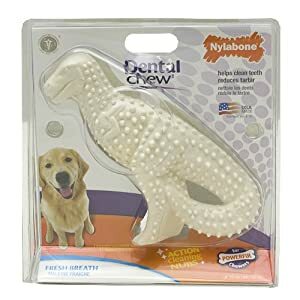 Nylabone has recently come out with DINOSAUR SHAPED DENTAL TOYS. Part of me imagines that the creative minds over at Nylabone sit around plotting about how to get *me* to buy more dog toys, and boy, did they get my number. I am powerless against cool dog toys. These are especially fun if you growl while you chew on them. Or so I'm told. There were three different dino-chew toys at Pet Food Express, and with AMAZING restraint, I managed to only buy two: a T-Rex and a stegosaurus. I have tried to use the chew toys as a learning tool, telling the dogs about the dinosaurs, but they remain unimpressed. "Cute" has a lot of value in our house, evidently. Andrew and I went for an appointment for SharkBean (a regular checkup) a couple of weeks ago. On the wall of the room, there is a "helpful" poster with weekly developmental milestones, and some of them had pictures of what the developing baby looks like. 15 weeks (where I am right now) looks like Golum. I am a terrible person for saying it, but that is exactly what the depiction looks like. The eyes on the poster, though closed, also seemed to follow me around the room. It was pretty creepy. I pointed it out to Andrew, who responded that at 15 weeks, we'll just have to call SharkBean "My preciousssssss". I love a gal who doesn't romanticize pregnancy! Great sense of humor, my preeeeciousssss! I hope Sharkbean gets your riotous sense of humor! I freaking love you so much!!!!! You are going to be a wonderful parent! My kids were unimpressed by the Royal Tyrell Dinasour Museum in Alberta while my husband and I geeked out. Maybe my dog will get me. Geez, I did not know that there was a right way to be a parent. And all these years, I've been doing it wrong. Your Little Friend is probably going to be broken forever now. NAAAAH! Don't should on yourself, because that's just BS. Be yourself and you'll do fine. Don't try to be mature, you'll never survive parenthood! A dose of crazy helps too! OMG! I didn't know you were pregnant! Squeeeeeeeeeeeee!!! That is teh awesome. btw, I called my first son ALF (alien life form) for quite some time. We called our baby Podling the entire time so no worries for SharkBean! Also, at the 20 week ultrasound do not be suprised if Sharkbean! looks like Skeletor from HeMan. My brother in law told me that and he was right. I have a toddler and an infant, and I still think my husband and I are not mature enough to be parents. Moments of humor are what make the day, and it's not fun being serious all the time. Speaking of Gollum, my 2-year-old daughter received a pompom ring from the dentist, and my husband taught her to call it "My Precious." And now that you've shown me that dinosaur Nylabone, I have to get it for our dog.